My name is Anaïs (@axanais), I’m 20 and I’m French. I’m studying video editing at an audiovisual school, in the little town of Montbéliard, in France (you don’t know where it is, right ? That’s normal). I have always lived in France, but I’ve travelled to Spain, Italy, England, Wales, a little bit of Germany, and I’ll soon travel to Scotland (and probably Quebec). My big passion is cinema: I have a lot of favourite movies, actors and TV shows. It is in some way what I live and study for and really, I couldn’t give you a list or it would fill two pages. If one day you see a girl, with a dress that looks like it is from the Sixties, listening to good old rock, being kinda clumsy, but always with a smile on her face, well, that could be me. I am a creative person and I always have been, and I think I need to be for the job I want to do (film editor/director one day, maybe, who knows?). I also love to do creative things, such as personalising items, trying to find some crazy make-up for Halloween, drawing, etc. I also play the saxophone. Currently, I am in my exam period, so very busy and kinda stressed, but I hope I’ll rock it. I’m also searching for an internship in Quebec for this autumn, as an assistant film editor, and I really hope I’ll find what I want. – The Imaginarium of Dr. Parnassus. This is my favourite quote, first, because that’s one of my favourite movies with Heath Ledger, who is my favourite actor of all time, and second, because it shows that nothing lasts forever. If I am in a bad moment, when I’m a little bit down and sad, where everything seems to go wrong, I know it won’t last forever, it will be better soon, in some way. Never lose hope: things will usually get better if you want them to get better. 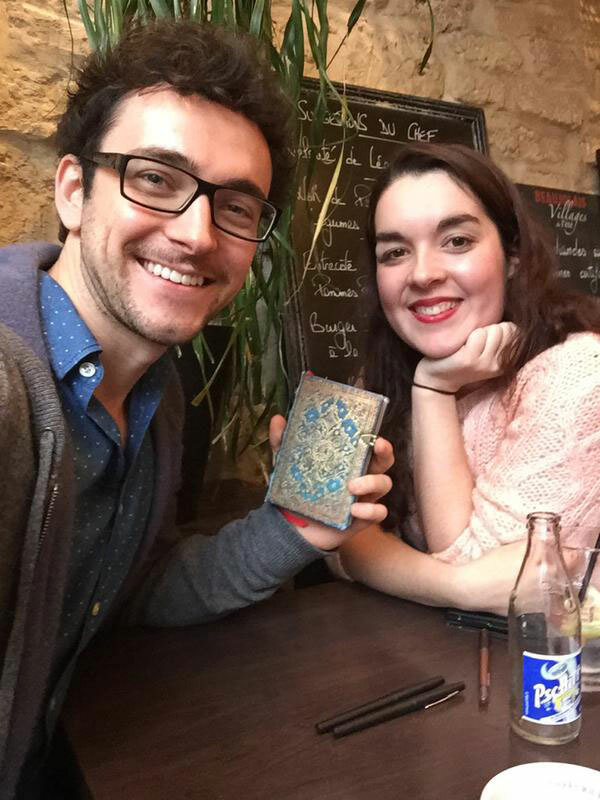 2) We saw on Twitter that you recently gave the actor George Blagden (Vikings) a very full-looking journal. Can you tell us more about this project? I did, yes! It was the 7th of December. So it began when, for my studies, I had to find an internship for November–December, and I wanted it to be in Paris. A few days later I learned that George Blagden was coming to Paris to film a new TV show, Versailles. I was really excited for the new show, because George is an actor I really admire. So now, I HAD to find this internship in Paris. And then I had an idea: I wanted to do a project where I (and other people) could tell him how much we admire him. Because you know, on Twitter, he is a very cheerful person, very close to his fans, and he always makes you smile when you need to. So I wanted to give him something back. Make him smile like he usually does for us. Actually, I told to myself that maybe, I would randomly bump into him in Paris, or maybe I could go to the place where they were shooting. I wasn’t sure how I could meet him, but I really wanted to do this project. 3) How did you meet the others who contributed? The first person I talked to about this project was Suus (@sprksnevada on Twitter), a friend I met on Tumblr and who really wanted to do it with me. So we put our ideas together and then I made an article on Tumblr and that was it. 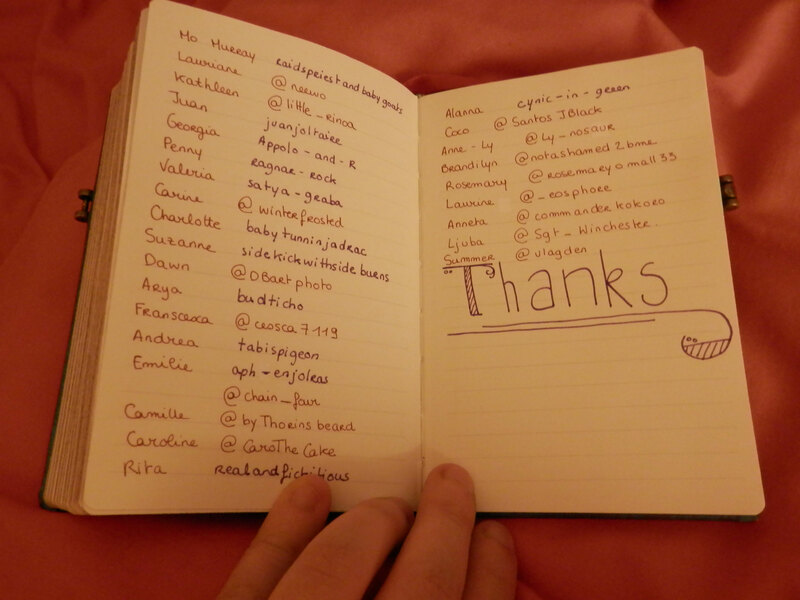 Fans from all over the world contacted me via Twitter and Tumblr and sent me what they wanted me to write in the book. 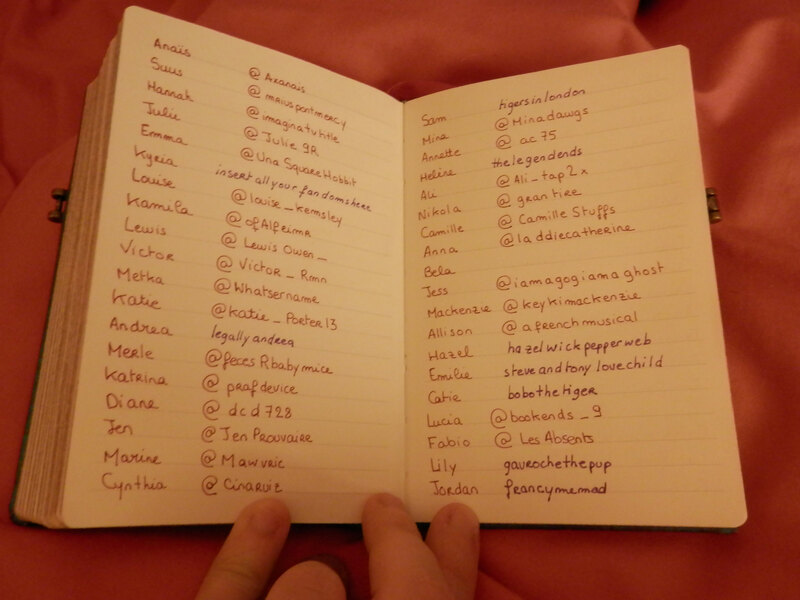 Suus, Hannah (@imaginatvytitle) and I shared the project on Twitter and Tumblr a LOT. I was amazed by the number of people who sent me words or drawings. It was an exciting project to do and I met a lot of amazing people from all over the world. If I remember correctly, around sixty-five people participated. 4) How did you arrange your meeting with George? That is the exciting part. Suus actually sent a tweet to George (while I was at school) and told him about the project, and he told me he would be glad to meet me. Of course, you can imagine my excitement! So we tried to find a date, but it was hard to find something THAT early. We both didn’t know exactly what our plans would be. Then, I think it was the first weekend when I was in Paris, I was doing my lonely tourist stuff in Montmartre because that is my all-time favourite place in Paris (I could definitely spend all my time there). 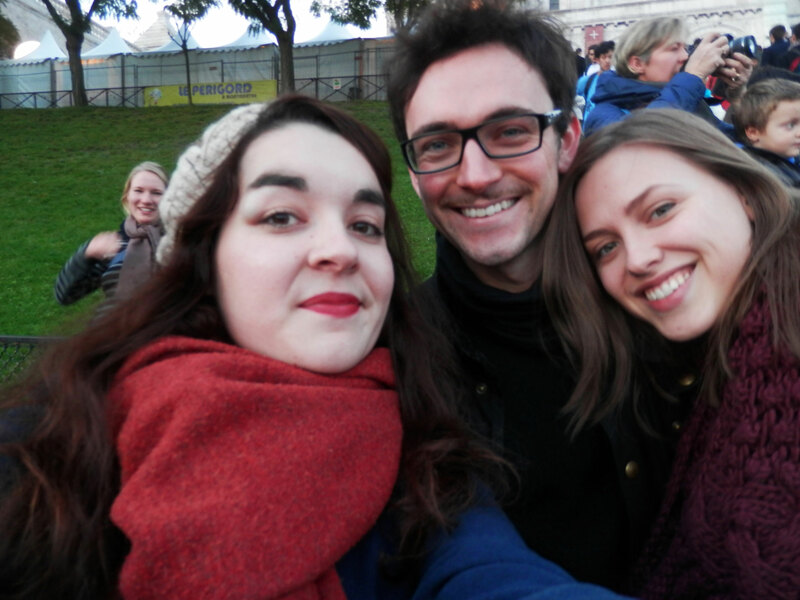 And at the end of the day, around 5:00pm, I was on the Place du Terte, ready to go back home when I turned my head and saw George Blagden and Elinor Crawley. I first hesitated to go to them, since they were together and I didn’t want to disturb them, but I also couldn’t let them go while I had been lucky enough to randomly bump into them, right? I finally found them back near the Sacré Coeur, tapped on his shoulder and said, “Hello, you are George Blagden, right?” He said “Hi” back and told me that yes, he was. I directly told him who I was, and he answered “Anaïs! For the book, right?” So yes, he knew who I was, and that was great. Then we had a little talk, and we took a picture together. But I didn’t have the book on me, since the project wasn’t finished yet. I still had a little bunch of things to put in. So we organised another meeting a couple of weeks after. 5) What was it like to be able to present the book yourself? We met around Republique and he was with a friend (Evan Williams, who I completely didn’t recognize. Ahhhh, sorry!). But then his friend left and we both went to a café. We had a little talk and it was great. You can imagine that I was a little bit shy, so maybe I didn’t talk as much as I wanted, but still that was great. He is an amazing human being, very cheerful and funny, and I really had the impression I was having a drink with a friend, you know? 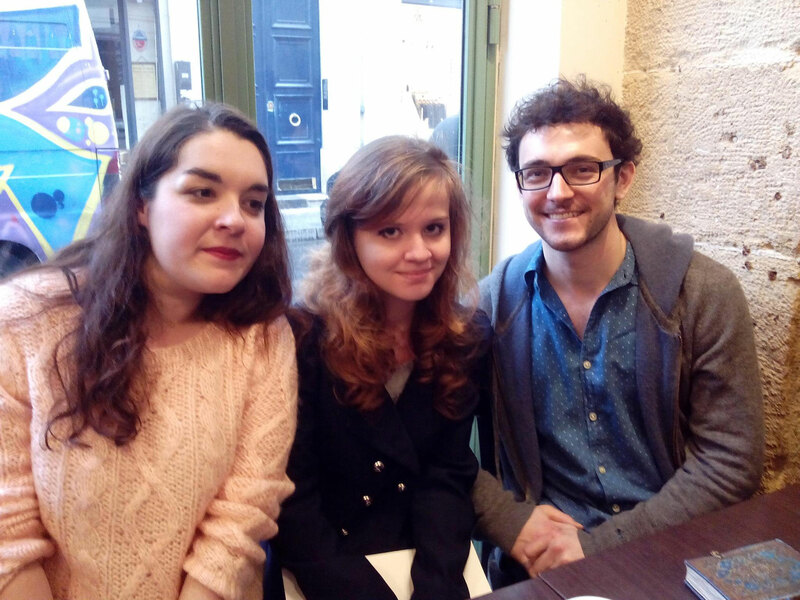 After I gave him the book, Caro (@CaroTheCake), a friend I also met on Twitter and who also loves George Blagden and participated in the project, came into the café to say “hello.” And I think she can agree when I say it was one of the best days of our lives. I can never be thankful enough to George, Elinor, Suus, Caro, Hannah and all the people who contributed to the book and made this possible. 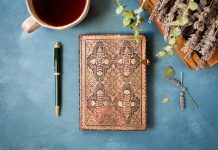 6) Why did you choose a Paperblanks® Equinoxe Azure journal for the gift? 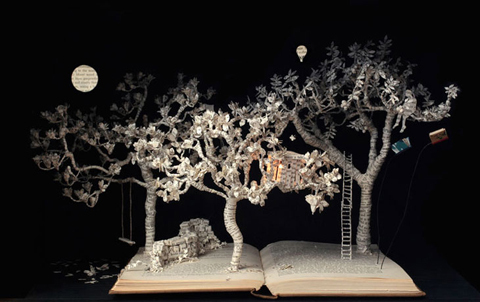 Well, here in France, or at least where I live, we have a loooot of Paperblanks® books in almost every book shop. And they are literally BEAUTIFUL. So how could we not buy it, especially when it is for someone special? I wanted a beautiful book for a beautiful project and a beautiful person. And you know, since he will play Louis XIV and there’s a little bit of gold on the cover, I thought it was a great idea! 7) How long did it take to fill the journal? 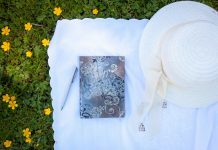 I began the journal around August, I think, and I finished it the week before meeting him, so it took me three to four months to finish it! 8) Any future group projects like this in the works? Not now, but it was such an amazing experience! So who knows? Maybe one day! 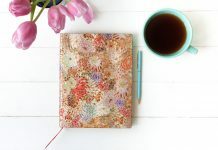 Like the journal featured in this post? Learn more about Equinoxe Azure in our product pages! Click here to see our Equinoxe series!